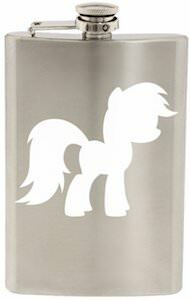 What pony do you think is put on this flask? My Little Pony fans will know the answer and my best guess for now is Rainbow Dash with his big mane and tail. This 8oz metal flask has an etched white image of a pony on it and it’s just white so you can’t really see what pony it is but one thing is sure this is a My Little Pony flask. 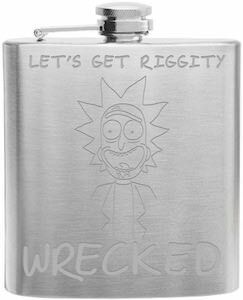 A flask like this is perfect when you go for a walk and are in need of a little bottle for a drink. And sure this bottle does not need booze water works just as well in this flask. This stainless steel hip flask has Dexter Morgan engraved into it. And a Dexter flask is all we need when we are thirsty. This is a Dexter flask is 8oz. 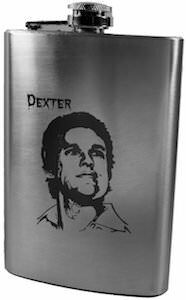 and has a picture of Dexter Morgan laser engraved into it and besides the face of a serial killer it also shows his name “Dexter” and that seems to drip a bit of blood. The metal flask has a screw down cap for easy access. Dexter’s flask also makes a great gift and that is why it comes in a gift box so that your are all set to pass out presents. Get ready for a drink out of you new Dexter Morgan Hip Flask. Hey Jack! who is everybody’s favorite uncle? Look no further than the witty, odd personality that can only be found in an old Viet Nam veteran Si Robertson who stars in the cool down to earth television series Duck Dynasty. This is a flask that has Si Robertson’s favorite saying on it ” Hey Jack! ” along with ” Si ” and a great head shot of Si Robertson him self. Made from stainless steel so it is rust proof and will be very durable, holds 8 ounces of sweet tea or your favorite comfort beverage. 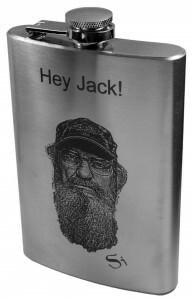 Support the Duck Dynasty crew with the Duck Dynasty Si Hey Jack 8oz Flask. Do you need a nice compact drink container that holds all the goodness you need …. “That’s What She Said”. Yes this is the famous line from the hit television series The Office. You can hear this catch phrase during many episodes said by many different characters. 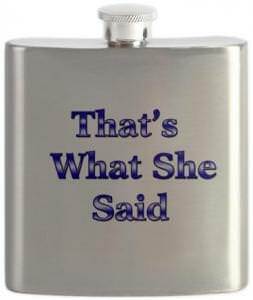 On the front of this really awesome flask find “That’s What She Said” printed in blue, this flask is made from stainless steel and will be very durable and keep a really nice shine to it. The “That’s What She Said” flask holds 6 fluid ounces and has a really sleek curved design that is specially made to fit in your pocket and hug the bodies curves to keep your favorite tasty beverage safe and secure.